Because of its nourishing quality, water has always been associated with wealth. Having fish swimming in water would correlated to abundant wealth being stirred or hastened. That is why it is considered very auspicious to have an aquarium in the home and the place of business. However, because this works like an omen, it has to be done in a ritually correct way. Otherwise, it can bring more harm than good. I will walk you through each of these considerations using Feng Shui principles so you can apply them to your aquarium. In terms of Feng Shui form, an aquarium should be located at the “Ju Qi” or the “Gathered Qi” corner (sometimes it is called the “Wealth Corner” because Qi is being gathered there). It is usually located diagonally across from the entrance to a room, like the door to the living room or the front door. Placement of the aquarium should also be against a solid wall for support. Your aquarium should be against a solid wall for support. In terms of time, during the time cycle of Period 8 (2004 – 2023), the Indirect Spirit is located to the Southwest. That is the best place to have water. In terms of the Five Elements, North is correlated to Water, whereas West and Northwest are correlated to Metal. These three directions are also good to have the aquarium because Metal generates Water, and being the same Element is also supportive. So apart from the “Gathered Qi” corner of a room, the Southwest, Northwest, West, and North are also good places to place your aquarium. A circular shape is associated with the Water Element. 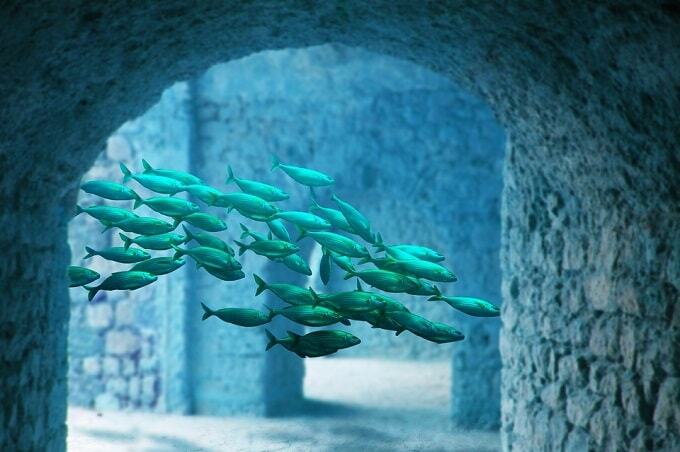 Since Water harmonizes each other, it is considered an auspicious shape for an aquarium. However, its size can be restrictive. A rectangular shape is associated with Wood. 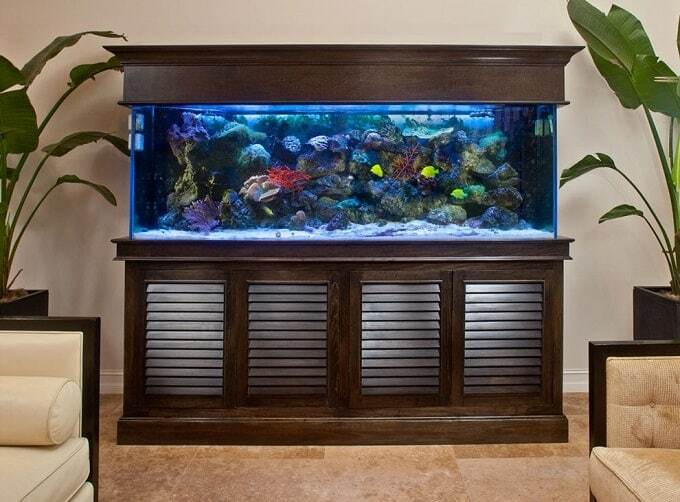 Wood can weaken Water, but since they are mutually interactive with each other, and Wood is associated with growth, rectangular-shaped aquarium is also an auspicious shape to have. Its size can be bigger and can better fit into the furniture of the house. Rectangular-shaped aquarium is also an auspicious shape to have. A square shape is associated with Earth, and Earth can imprison Water. Thus, it is not desirable unless it is located in the West or Northwest direction, where the Element of the direction can neutralize its harmfulness. A triangular shape is associated with Fire, and Fire fights with Water. It is not an auspicious shape to use as an aquarium. Besides, it is hard to clean a triangular tank, and the corners are not usable. A multi-sided configuration, like a 5-sided, 6-sided, or a Bagua shape (8-sided), has different connotations. It is best to avoid them unless you have a good reason to use them. So out of these different shapes, the rectangular and circular shapes, which can be elliptical or wavy, are the best for an aquarium. Please also keep in mind the size of an aquarium can affect the number of fish you can have. So please make sure that you can get some expert’s advice as to what is the maximum number of fish you can have in a particular size tank before your fish die mysteriously. Odd numbers are considered Yang numbers and even numbers are considered Yin numbers. Generally speaking, odd numbers like 1, 3, 5, 7 and 9 are considered auspicious, while the even numbers like 2, 4, 6, 8 and 10 are considered less auspicious. That’s because in terms of phonetics, the sound for “a pair” and for “injury” have the same sound (‘shang’). 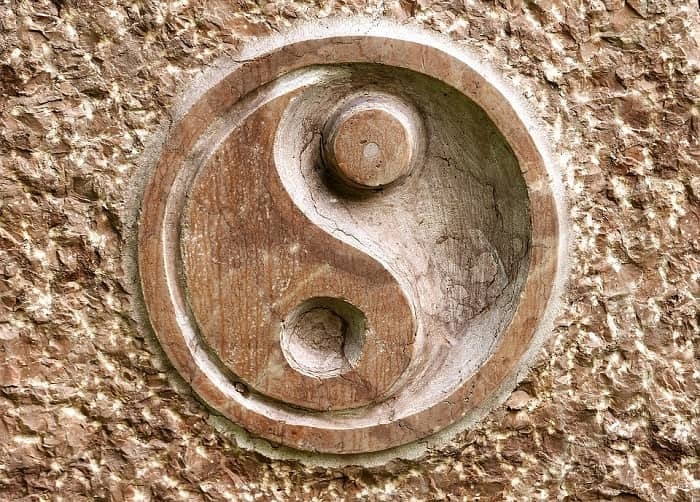 Consider the Yin and Yang of numbers – where odd numbers are Yang and auspicious. Some justify the rule by saying the Chinese prefer Yang over Yin, but that is not quite the case. Rather it is better to have Yin and Yang together instead of two Yin or Two Yang together. If you have a good-sized aquarium, then 9 is an auspicious number of fish to have. That’s because 9 is not only the most Yang of the Yang numbers, but it sounds the same as “having more than enough”. 3 is also an auspicious number because it sounds the same as being alive and growing. 6 is auspicious as well because it sounds the same as “having a good income”. In Feng Shui, 1, 6, 8 and 9 are the auspicious Purple-White Stars, so they are good numbers of fish to have. However, 1 being a singular number on its own, is not the best. You might like to reconsider having just 1 fish unless it is the only number of fish you can have in a small-sized bowl. In Feng Shui, the combination of the numbers 1, 6 and 4, 9 are considered to be Early Heaven Water and Metal. They are both associated with wealth, so having 1, 6, 4 and 9 number of fish are also considered auspicious. You can also have these two combinations with two lots of different color of fish, especially 4 and 9, since the number 4 on its own is not favored by the Chinese. That’s because 4 has the same sound as “death”. Your Animal sign also can be correlated to an Element, matching the Hetu pairing of numbers mentioned above, which can be considered auspicious. 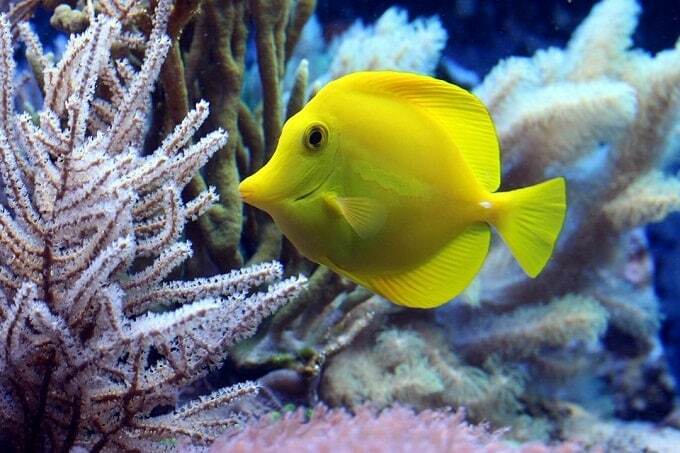 Salt water fish: Saltwater fish like Angelfish and Clownfish are very colorful and quite enjoyable to look at. However, they are prompt to dying unless you can keep a close eye on the salinity and continual maintenance of the water. Tropical fish: Tropical fish like Guppies and Danios are also very colorful to look at but they are more difficult to breed and maintain than saltwater species. Otherwise, they die, and that is not an auspicious sign. If they do perish, they must be replaced straight away to avoid bad luck. Goldfish: By comparison, goldfish are relatively easy to look after since they are a smaller member of the hardy carp fish family. The term goldfish is misleading because apart from the gold color, there are many varieties of color and shapes to choose from. Goldfish is the preferred choice to have from a Feng Shui perspective. Most fish on the market are generally bright and colorful to promote sale, for colours can stimulate a happy and positive feeling in the perceivers. From a Feng Shui perspective, the different colors are correlated to the Five Elements, with blue and black belonging to Water, gold, white and silver belonging to Metal, yellow and brown belonging to Earth, red and purple belonging to Fire, and green and jade belonging to Wood. The best colors in an aquarium should be ones that belong to Metal, and this should be the predominant color of the majority of your fish. That’s because Metal can generate Water, and Water is associated with wealth. Colors belonging to Metal should be the predominant color of the majority of your fish. Colors belonging to Water are second best because they are of the same kind to the water. You can also use some Fire because Fire and Water can be mutually generative, like cooking rice in water to make a meal. However, the Fire cannot be too strong. Both Earth and Wood will tend to either fight or weaken the Water, so it is better not to have them as the main color in an aquarium. Feng Shui thinking is based on correlations. What is considered auspicious or harmful, in other words, is what is considered luck or unlucky. They are correlations. Plus, correlations are not causations. So please don’t get the idea that just because you have an auspicious or a lucky number of fish, everything in your life will be roses. It is not that simple. As I said earlier, what you read here are man-made omens or portents that will make you feel positive and energized. You still have to work hard to achieve what you want out of life. Please note: This article is a comprehensive guide on Feng Shui fish and aquarium for abundance. Do NOT post questions here because Uncle Dixer will not see the comments posted here. Also, Uncle Dixer will NOT respond to questions about fish number or aquarium locations. Please use this guide for your questions about fish numbers or aquarium location. Thank you. Hi i have 11 goldfish is it ok? I have two rectangular aquariums. One is placed in the living room with arowana fish. The other one is placed in the dining room with 8 gold fish and 1 black more fish. 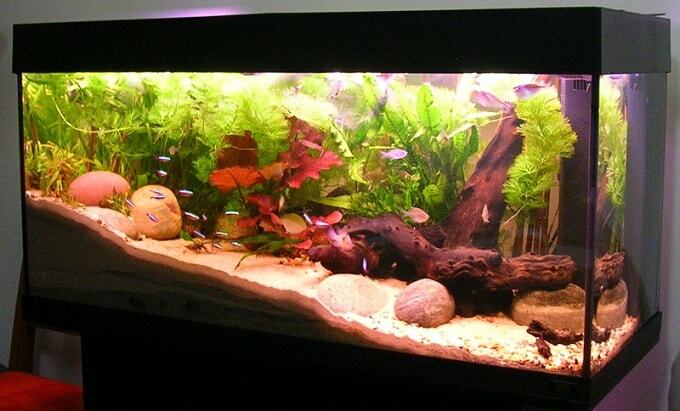 I need to know the best position for my aquariums.